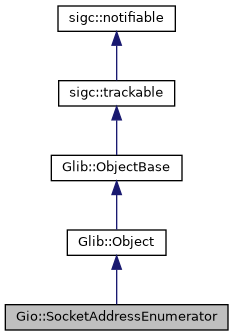 Enumerator type for objects that contain or generate SocketAddresses. Retrieves the next SocketAddress from enumerator. Note that this may block for some amount of time. (Eg, a NetworkAddress may need to do a DNS lookup before it can return an address.) Use g_socket_address_enumerator_next_async() if you need to avoid blocking. If enumerator is expected to yield addresses, but for some reason is unable to (eg, because of a DNS error), then the first call to g_socket_address_enumerator_next() will return an appropriate error in * error. However, if the first call to g_socket_address_enumerator_next() succeeds, then any further internal errors (other than cancellable being triggered) will be ignored. A SocketAddress (owned by the caller), or nullptr on error (in which case* error will be set) or if there are no more addresses. Asynchronously retrieves the next SocketAddress from the enumerator and then calls slot, which must call next_finish() to get the result. cancellable A Cancellable object which can be used to cancel the operation. slot A callback slot to call after the resolution completes. Retrieves the result of a completed call to g_socket_address_enumerator_next_async(). See g_socket_address_enumerator_next() for more information about error handling.